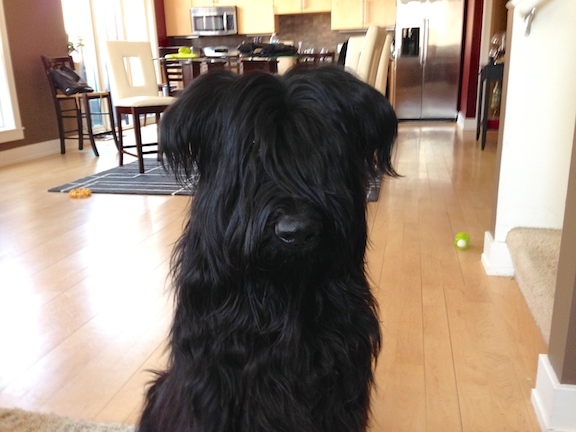 This handsome guy is Oliver, an intact one-year-old Briard male. His owners contacted me to help put an end to a few unwanted behaviors; getting over-excited when guests arrived, jumping up on guests, not respecting personal space, pulling on the leash as well as attempting to heard dogs and young children. When I arrived for the appointment Oliver was inquisitive and very nosy, literally sticking his nose into my crotch, my bag, jumping up on me and showing quote a bit of excitement. I showed his owners my preferred technique to disagree with Oliver’s attempts to claim me when he jumped up on me. I had to repeat the technique a couple of times throughout the session before he seemed understand that I disagreed with his jumping up. The technique communicates a message to the dog that if it is going to jump up, the human is going to determine when the dog will be allowed to get down. Usually once dogs realize this, their desire to jump up abates quickly. Anytime I encounter his dog that gets over-excited, I always suggest that their owners place the dog on a leash in a timeout every time the dog gets too excited to control itself. The timing of this is critical. I like to say dogs have 10 levels of energy. The trick is to put the dog in a timeout any time it passes whatever its owners consider level five energy. By consistently stopping the over-excitement and giving the dog a timeout to calm down, we can communicate that overexcited energy is unwanted and has a consequence. Next I suggested their owners adopt a set of escalating consequences any time that Oliver broke the rules or boundaries that they wanted him to respect. It’s important that we consistently apply these escalating consequences as soon as the dog engages in any unwanted behavior. This is particularly effective for dogs that don’t show respect for a human’s personal space. Because Oliver kept circling the coffee table in front of the couch in the living room, I suggested that they place his doggy bed at the end of the couch so that he has a place to go whenever the family is hanging out. To encourage him to use this doggy bed I tossed a high-value treat in it while Oliver was across the room. Oliver immediately trotted over to the bed and scooped up the reward. As soon as he walked away from the bed, I tossed another treat in, repeating the process. After doing this a few times I asked Oliver sit on the doggy bed, and then gave him a treat when he laid down. His owners wanted to incorporate the word “home,” so we repeated that that phrase each time the dog received his reward on the bed. I suggested that his owners drop a few high-value treats onto the doggy bed when Oliver was away from it as well as present one to him anytime that he laid down on the bed – always repeating the command word the second the treat touched his lips. Within a few days Oliver will start to associate the word “home” with going to or laying down on the doggy bed. This way his owners can clearly communicate an action and place for him to go when he becomes a nuisance. Next I fitted Oliver up with a Martingale collar and added my special twist to the leash. As we walked away from his apartment we encountered a neighbors dog outside on the second level balcony. Oliver immediately reacted with some pulling and very Chewbacca like sounds, LOL. As soon as he started, I stopped and asked Oliver to sit. At first Oliver ignored me and attempted to peek around my body at the dog that was growling at him. It took quite a bit of coaxing, but eventually I was able to get Oliver to sit down. We left the apartment complex and started walking towards the street. Oliver’s owners had previously told me that he occasionally lunges at passing cars and reacts to parked cars. To test this, I walked him around the closest parked car which he did not react to so I walked him across the street so that we could be standing close to the road when cars passed by. At first I was able to control Oliver fairly easily, however as we got farther away from his apartment his intensity and excitement levels continued to rise. Usually the Martingale collar and leash are extremely effective at curbing unwanted behavior and giving the walker more control over the animal. But in Oliver’s case it was nothing short of a wrestling match. He was so focused on passing cars and people that he paid almost no attention to myself or his owners. I walked him about 12 feet away from the street and tried to get him to sit and calm down. Usually this technique is very effective at giving the dog some perspective and the distance allows the dog to calm down. Unfortunately Oliver turned out to be that one in 1 million dogs that reacted differently. It took a considerable amount of effort to get him to sit, and he did not remain sitting for long. Additionally, his energy level remained elevated. These factors coupled with his breed’s intense desire to heard things all contributed quite a bit of work which obviously makes walking him a chore rather than an enjoyable activity. Whenever I encounter a dog with multiple related issues, I have found the best method of rehabilitation is to focus on them one issue at a time. The first step in Oliver’s rehabilitation needs to be conditioning him to sit on command while on the walk. Oliver knows and promptly responded to the sit command inside, so I told his owners that they need to practice this command outside in a low stimulation environment. Because Oliver’s apartment complex included a pathway that was isolated away from the street, I suggested that his owners try my “long walk” technique there. This technique involves the owner walking the dog at a heel, stopping every few feet then asking the dog to get into a sitting position before continuing. I suggested that they practice this technique daily until Oliver sits without being asked to any time that the human stops. As a sit is a more subordinate position, practicing this command outside will help Oliver “snap out of it” and look to his owner’s anytime he gets fixated on an object or person. Once Oliver is consistently responsive to the sit command while on the leash away from any people or cars, the next step is to move to an area that includes a low level of stimulation. This gives his owners the ability to practice asking Oliver to sit in a more challenging situation. At first his owners will need to practice these situations from a distance. Once Oliver shows that he can handle the situation at a longer distance they can begin to close the gap towards the stimulation small steps at a time. This gradual process allows the dog to grow comfortable being close to activity that normally causes it to react to. Anytime that Oliver gets too reactive, I told his owners to back up a few steps until they find a distance he can remain calm at. Because Oliver showed a healthy interest in the high-value treats I was using, I suggested that his owners incorporate them throughout this rehabilitation process. Not only do they provide a great reward when Oliver complies, the strong aromas can help distract him from focusing on the things that normally cause him to react. When we returned to his apartment, Oliver was wiped out. He laid down on the floor as we discussed the walk and his behavior in their kitchen. They informed me that Oliver had an appointment to be neutered in a few weeks. While that alone will not fix Oliver’s unwanted behavioral issues, it should lessen his intensity and determination considerably. That will make it much easier for his owners to incorporate the new technique’s, rules, boundaries and limitations that we went over in the course of the session. I mentioned that one of my former clients had a lot of success by introducing agility training to the dog. As a working class breed, this may be just the “job” that Oliver needs to channel his energy and desire to work. Because his owners were very engaged and determined to correct these unwanted behaviors, I’m confident that Oliver will learn to follow their lead and learn to calm down. It will take patience to complete this step by step rehabilitation, but as they put in the practice, it will be much easier for his owners to communicate what they do and do not want, inside and out.